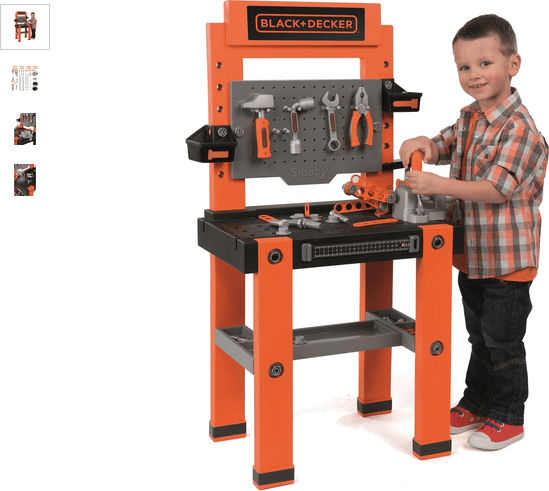 The Smoby Black and Decker Tool Bench is a tremendous way to stimulate the creativity of little ones thanks to its amazingly realistic design. Coming complete with a massive array of seventy-nine (79) accessories such as screws, nuts, bolts and nails and with seven (7) different tools (a hammer, screwdriver, pliers, spanner, Allen wrench, saw and adjustable ruler) to engage the accessories with, this workbench is sure to become a firm favourite of your most cherished as they spend hours immersed in their own amazing make believe world. Get money off with April 2019 free Argos voucher codes, see if there's a promo code for the Smoby Black and Decker Tool Bench product. Argos may be out of stock of this product. To enhance your shopping experience you may also be redirected to a search results page when you click an outbound link.